Combine chicken with vinegar, cornstarch and egg white In a ziplock bag. Refrigerate while you prepare the rest of the ingredients. Combine all ingredients in the cooking sauce and set aside. Place 1 1/2 tablespoons of oil in the pan and heat over medium high. Add chicken and cook about 3 minutes. Remove from pan and set aside. Heat remaining oil in the pan and add garlic, ginger, jalapeño and green onions. Fry until fragrant (about 2 minutes) and add in mushrooms, water chestnuts and red peppers. Cook until juices evaporate (about 4 minutes). Add in chicken and cooking sauce. Cook about 3 minutes or until heated through. Place chicken mixture in a bowl. Serve with washed lettuce leaves, julienned carrots & cucumbers, bean sprouts and serving sauce. If you've had lettuce wraps at PF Changs, they are served with crispy rice noodles. I opted not to include the rice noodles in this recipe to make it a little bit healthier. If you want to add them they are fairly simple to fry up! Heat 2 cups of vegetable or peanut oil to 350 degrees. Separate your noodles and drop one in. If it crisps up right away, your oil is ready. Drop noodles in the hot oil in small batches until they crisp up (just takes a few seconds). Drain on paper towels. 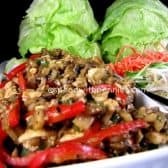 Serve with lettuce wraps.